We work closely with our customers to supply the highest quality RF tooling & RF welding services. Our goal is to keep our customers productive and competitive in today’s rapidly changing business environment. Using state-of-the-art computer software and machinery, we can design and build complete assembly tooling systems. Whether you are in need of single cavity prototype dies, material loading fixtures or complex multi-cavity production tooling , we are your source for RF (Radio Frequency) turnkey solutions. Sealing Industries Inc. can design and fabricate blister seal tooling to the customer’s specifications. 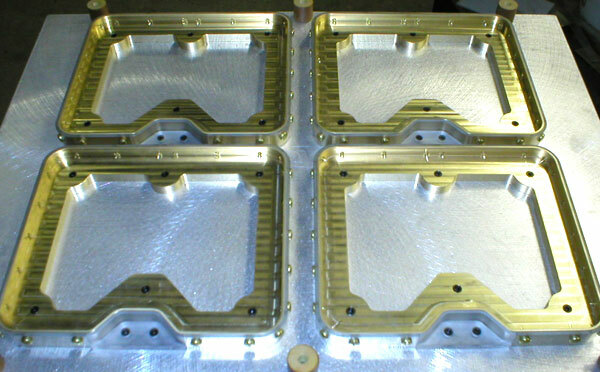 We specialize in rapid manufacture of trays for all models of blister machines and heated presses. In addition, we can show you how to use your existing RF machine to seal blister packages. Sealing Industries can create heat sealing dies that are ready to use as received. You can custom order your dies by specific machine size, mounting hole center, size of bed plate, size of upper platen, and by whether the machine has a heated upper plate. We will need you to determine the thickness of the plastic to be used and desired trim for tear seal waste, and type of rule. Send us you blue prints, sew patterns, or sew samples with some material to be used and and we will custom make your die to your specifications! Read more information about dies, including ordering, repairing, storing, and buffer use.